A couple of weeks ago my sister-in-laws mom, sent me a box of fabric, in it was about 15m or maybe more, of pin-stripes ticking. Far too much to fit in my fabric storage space, so I decided that everyone and their dog would be getting a bag this year. I used the ticking for the base fabric and the Ebi-kun and I picked out a different fabric for each kid for the flap. 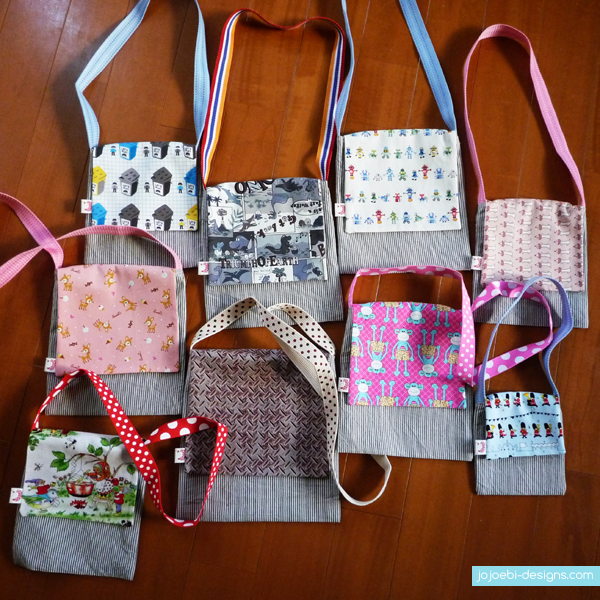 The kids range in age from one and a half up to 12 so I made the bags in different sizes. Once I had the cutting out done (my least favourite part) the actual sewing didn't take long at all and it was so much fun making so many different bags! 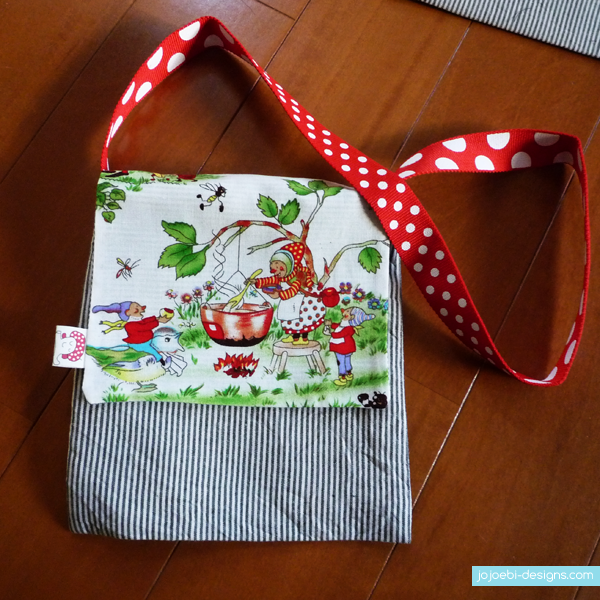 I think this one has to be my favourite, the flap fabric is just adorable and the spotty strap just fits with it so well. I want to give my friend Jacqui a quick plug here, she makes adorable kids bags, so if you are looking for one, check out her site Meeabee, she does custom orders too so drop her a line if you are looking for something specific. The bags are adorable! Love the fabric! I have started making my girls grocery bags. They haven't really caught on here in the southern US, but homemade ones are so much cuter than the ones the stores carry.